Watched a wonderful programme on BBC4 last night – Robert Hughes on Goya Crazy Like a Genius. This was fantastic television and a reminder of just how good a critic the late Hughes was. He opens out Goya’s world and art, with nothing closed down or obscured by specialist critical terminology; just simple, lucid explanation, with vast knowledge, admiration and enthusiasm for the work and the man shining through. 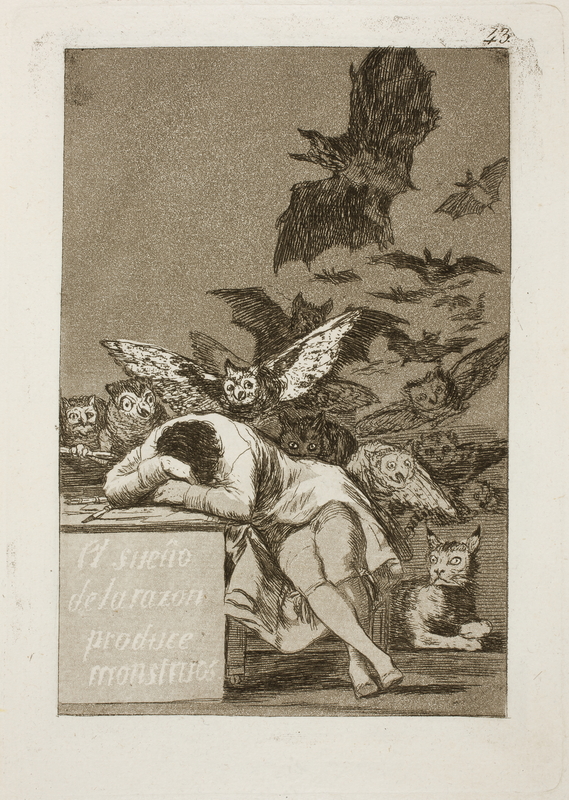 I think I first encountered Goya through one of Neil Gaiman’s Sandman comics – there was a version of The Sleep of Reason Produces Monsters (El sueño de la razón produce monstruos) in one episode. As a romantically inclined, somewhat morbid teenager, this vision of a tortured artist mobbed by night fears, bats and owls, seemed to say something profound. I wasn’t quite sure what, but I found this depiction of a nightmare enormously compelling. Some years later, visiting a friend in Madrid, I went to the Prado and headed straight for the extensive Goya collection. Of all the famous paintings on display, I found myself drawn longest to the Pilgrimage to St. Isidore’s hermitage. One of the Black Paintings, it’s a haunting, disturbing painting, a dark counterpoint to Goya’s sunny earlier painting of St Isidore’s meadow, this later work portrays a kind of crazed carnival procession, touched by madness and the devil as a collection of grotesque singers shamble over the hill and towards the foreground and the open mouthed onlooker. It’s the kind of painting you almost have to force yourself to turn away from. Hughes in the programme and in his book on Goya, is brilliant at describing the power and strange beauty of these works. As an interesting aside, a decade ago there were claims by a Spanish Professor of Art at Complutense University in Madrid, Juan José Junquera, that the Black Paintings cannot be by Goya. Instead they may be the work of his son Javier, or his son Mariano. Other experts have dismissed the suggestion as speculative at best, but if true would potentially shatter a key pillar of modern art history. Hughes’ programme is currently no longer available on BBC iPlayer, but there is a recent blog by the executive producer Nicolas Kent on its making. Brilliant. Watch it if you can, and/or buy Hughes equally excellent book. Was Goya really the artist behind the Black Paintings? I have known a few geniuses, and they are a bit crazy. Or we are…not sure. They look at the word in such different ways.